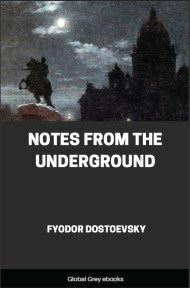 Notes from the Underground is an 1864 novella by Fyodor Dostoyevsky. 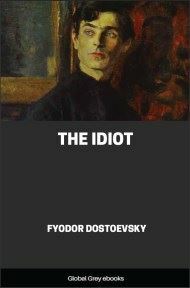 It is considered by many to be the first existentialist novel. 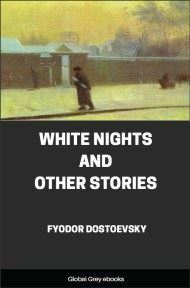 It presents itself as an excerpt from the rambling memoirs of a bitter, isolated, unnamed narrator who is a retired civil servant living in St. Petersburg. 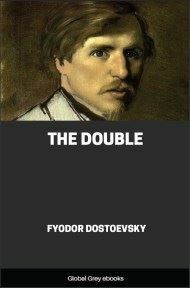 The first part of the story is told in monologue form, or the underground man's diary, and attacks emerging Western philosophy. 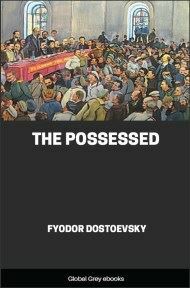 The second part of the book is called "Àpropos of the Wet Snow", and describes certain events that, it seems, are destroying and sometimes renewing the underground man, who acts as a first person, unreliable narrator. I have been going on like that for a long time--twenty years. Now I am forty. I used to be in the government service, but am no longer. I was a spiteful official. I was rude and took pleasure in being so. I did not take bribes, you see, so I was bound to find a recompense in that, at least. (A poor jest, but I will not scratch it out. I wrote it thinking it would sound very witty; but now that I have seen myself that I only wanted to show off in a despicable way, I will not scratch it out on purpose!) When petitioners used to come for information to the table at which I sat, I used to grind my teeth at them, and felt intense enjoyment when I succeeded in making anybody unhappy. I almost did succeed. For the most part they were all timid people--of course, they were petitioners. But of the uppish ones there was one officer in particular I could not endure. He simply would not be humble, and clanked his sword in a disgusting way. I carried on a feud with him for eighteen months over that sword. At last I got the better of him. He left off clanking it. That happened in my youth, though.